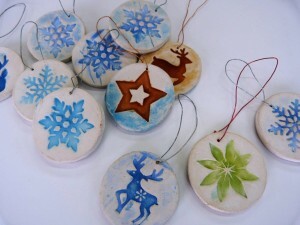 Create extra-special Christmas tree decorations for you, your family and special friends! The Christmas clay creation station opens on the afternoon of Monday 14th November 5pm – 7pm. Then you’ll return the same time, same place the following week to glaze your pieces. Your pieces will then be ready to put on the Christmas tree before the 1st Decemeber. The price is £25/particpant for the two sessions - clay making and glazing. My daughter loved making clay Christmas decorations. It was great for her to create something handmade and that she will proudly see hanging on our tree for years to come. The Phoenix studio is a warm and friendly place to visit and this course was a fun, Christmas-y way to spend a few hours together! After a warm welcome in the studio we made some fantastic Christmas decorations. A fun, creative and festive way to get into the spirit of things. My daughter had a great time making decorations we will see on our Christmas tree year after year. I also enjoyed my cuppa and mince pie! I would definitely recommend this activity, suitable for all ages.